Happy Wednesday everyone! Hope you're having a great week so far and are able to enjoy some nice spring weather. 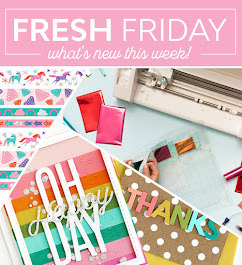 It's new release day over at Whimsy Stamps today, lots of gorgeous new stamps are being released, as well as dies and new designer papers and Shape EZ templates too. 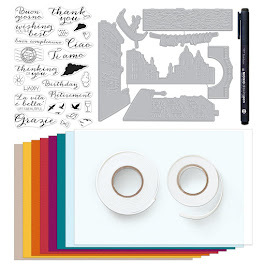 Be sure to check them out here in the store, or you can see them all here on the Whimsy Inspirations Blog. 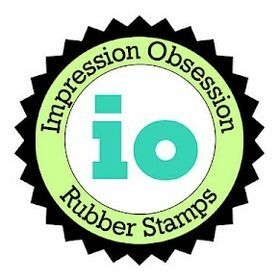 Starting this month we are doing things a little bit different at Whimsy Stamps, instead of the 7 day Showcases, we will be having 3 days of blog hops - Sneak Peek Day (which was yesterday), Release day (which is today) and then Review Day (tomorrow). And we will be showing you more Whimsy Cards spread out a little bit more over the month. I really like this new change, although I loved being part of several hops, it is much easier for me creating on a weekly basis instead of all at once. Of course we are still having prizes to give away, with our hops, so be sure to visit all the Designers participating in today's hop, to be entered into the prize draw. You have 24hours to comment, starting 12noon EST. Since today's release day falls on the same day as the Whimsy Stamps Challenge (rubber design team creations), I have created this card for both, the challenge and the Release Hop. The challenge this month is "Pretty in Pink", and you have about two weeks left to play along for a chance to win one of the prizes up for grabs. I promise, my pretty designer paper is really a hot pink with some softer pink, although it kind of looks more purlpe-ish in the photo. I used the stamp Lemon Pepper Beach Bucket from Whimsy's Elisabeth Bell collection. Isn't she adorable! I colored her using my Faber Castell polychromos pencils, as usual. The beach, ocean and sky were done using a brayer. 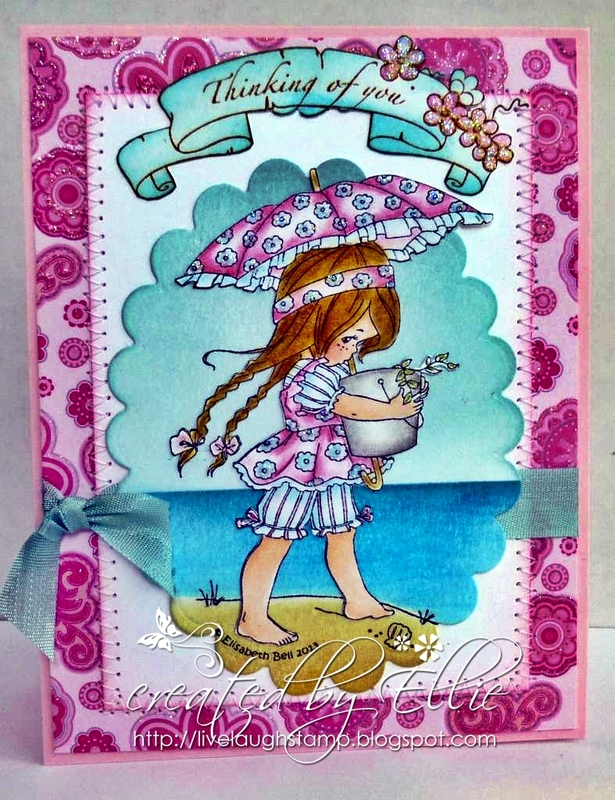 The beautiful sentiment is part of another new release set, from the Sylvia Zet collection - Flower Fairies. 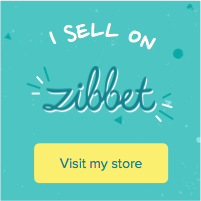 I thought it would be just perfect to use with the Elisabeth Bell stamp. Papers are from a DCWV paper pack. I added some sparkles and some seam binding ribbon, and finished it off with some machine sewing. Hope you like my creation! Inks: Sahara Sand, creamy caramel, tempting turquoise, island indigo, soft sky (all for brayering), memento tuxedo black for images. Don't forget - to be entered into today's prize draw for the blog hop, you have to visit all the participating designers. You can find the complete list of stops right here on the Whimsy Inspirations Blog. There is no hop order, and no other rules, all you have to do is visit each one of today's designers and leave a comment. 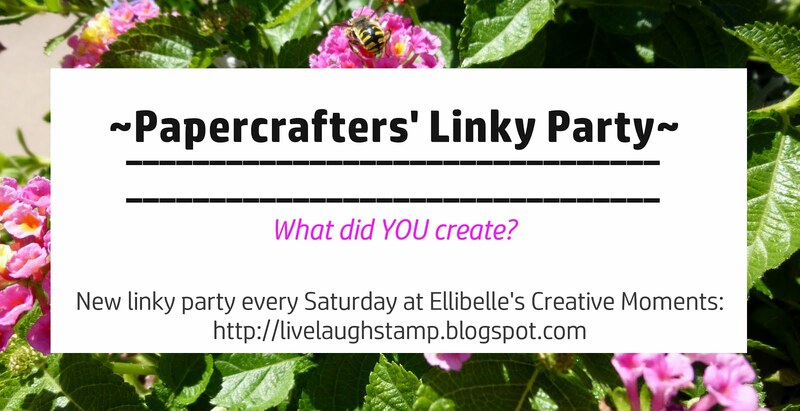 Thanks so much for stopping by, and have fun hopping, and if you're up for challenge, why not check out Whimsy Inspires Challenge. As always, you don't have to use a Whimsy Stamp to be eligible to win. What lovely summery colours Ellie and of course your perfect stitching (even with that poorly machine). Hope the children are all better now. A gorgeous image. Love the colours. Very sweet card...love the colouring of the image. Darling card! Love your beautiful coloring and that sweet image! Beautiful card, Ellie! Love the color combo and adorable image! Terrific coloring! Such a beautiful card Ellie!! wow, the water looks amazing!! So cute! Love the colors you used and you did a great job coloring the image. Wow.. This is so pretty. Those are wonderful colors. Hi Ellie~~Awhh so cute!! Love EB images totally and the sentiment above is very fitting!!! Hey girl I LOVE the idea of inside messages for cards--WTG!!!!! Such a gorgeous card! Love the rich, vibrant color! OH What a lovely and beautiful card!! Such beautiful coloring!! Love the fun colors on this and the sweet beach scene! Darling card! This is gorgeous Ellie, I like the adorable image, the colours and the stitching. Sweet! I love your coloring and stitching! She is adorable and you framed her & colored her perfectly!! What a gorgeous card - Love the banner.